The first step in appropriate skin care is to know your skin type. There are five basic skin types: normal, oily, dry, combination, and sensitive. Skin type is determined by how much oil the skin produces. 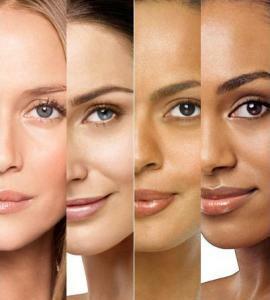 Each skin type has unique characteristics and thus needs to be treated with different skin care products. To find out your skin type, you can do the tissue test. Wash your face with a cleanser, rinse well, and pat dry. Wait for about an hour. Then press a clean piece of tissue on your face and leave for about one minute. Remove the tissue and look for oily stains on it. – Normal skin: There are faint oily stains on the tissue. – Oily skin: The tissue has lots of oily spots. – Dry skin: There is no oily trace on the tissue, and your skin feels tight. – Combination skin: The tissue only picks up oil on the forehead, nose, and chin. – Sensitive skin: This type of skin can occur in any skin type. If your face feels irritated or slightly itchy, you have sensitive skin. Your skin type can change due to several factors so you need to repeat the test four times a year (seasonally) and may have to change skin care products if your skin type changes. – Normal skin: This skin type is the ideal because it is the least problematic type. The skin looks smooth and has healthy complexion. – Oily skin: People with oily skin are likely to have dull complexion, enlarged pores, blackheads, acne, and other blemishes. However, it is less prone to wrinkles and other signs of aging. – Dry skin: People with dry skin have small skin pores but are prone to premature aging. The skin is tight, ashy, or flaky. – Combination skin: People with combination skin are likely to have enlarged pores on their foreheads, noses, and chins but dry skin on their cheeks and around the eyes. – Sensitive skin: Sensitive skin often has similar characteristics to dry skin but sensitive skin becomes irritated and inflamed more easily. The signs of inflammation include redness, dermatitis, broken veins, capillaries, and bruising. What Factors Can Change Your Skin Type?